So this announcement was all over the tech news the other day, but I must say I'm having a bit of a hard time understanding the rationale behind this big integration effort.. I mean while Google Docs may have provided an API that allowed Box.net to "hijack" their app, is this really the model they will support going forward? Isn't their business to get people over to their Google Apps platform? And havent' they been actively building out their own document management solution? While I really like what Box.net has done - they've found a lot of value to add around online document backup - this is great, kudos, but this move just seems amateurish to me. If this was about providing online document editing, they could have licensed or developed their own technology (afterall didn't they just raise $48 million?). If this was about fending off the threat from Microsoft's Office 360 and buy them time to develop their own, there might be some merit to that, but seems like confusing a customer is a high price to pay for a questionable benefit. I would like to see Box.net keep developing value around document management (workflows, approvals, etc.) and develop their own online editor.. That would make things clean and understandable to the customer.. What do you think?? If you run a time slot based business (coaching, counseling, dental office, photography, beauty salon, spa, medical office) scheduling and rescheduling is a full-time job, and one that is prone to errors and misunderstandings.. An office manager or provider themselves will usually spend time with each client when scheduling the appointment, then come rescheduling and cancellations and last minute trying to fill the slot. 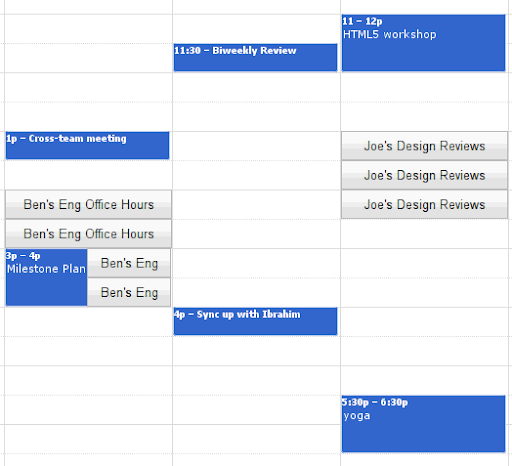 Google Calendar's new Appointment Slot feature is a FANTASTIC attempt to deal with this exact problem and could very well be the biggest PRODUCTIVITY ENHANCER of the year!